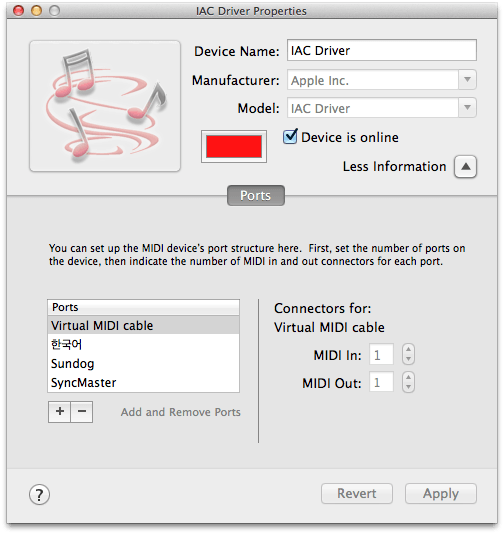 Open the "Window" menu and click on "Show MIDI Studio"
You can rename the Device Name if you like, but please only use characters that are available on an English keyboard! "IAC Driver" is fine, "哈佬" not so much. Create a new port by clicking on the "+" button below "Ports" (see the screenshot below). Again: Name the port as you like, but only use English characters (the second port name in the screenshot wouldn't show up in the feelyoursound.com software, for example).